Sheikh Mohammed being briefed on the upcoming projects. Dubai Municipality is currently implementing key infrastructure development projects worth Dh6.5 billion ($1.76 billion) including the Dubai Deep Tunnel Storm Water System and the world’s largest single waste-to-energy plant in the Warsan area of the emirate. A first-of-its-kind in the Middle East, the Dubai Deep Tunnel Storm Water System aims to collect and convey groundwater and stormwater run-off, and then store it and direct it to the sea. The project is critical to face future challenges coming from rains over the next 100 years. It has a capacity of 110 cu m per minute, which is double the flow of the Thames River in London, said the statement from Dubai Municipality. The project, which will drain 40 per cent of the entire area of the city, aims to serve the whole of Dubai South, which is home to Al Maktoum Airport and the Expo 2020, it added. The government seeks to develop projects and find creative solutions for achieving the strategic objective of ensuring sustainability and providing services for citizens, residents and visitors that meet the highest international standards, remarked HH Sheikh Mohammed bin Rashid Al Maktoum, Vice President, Prime Minister and Ruler of Dubai, after reviewing the projects. He pointed out that providing a high quality of life for citizens was a key priority for the government. This helps ensure that the UAE remains a development model centred on the happiness of its people, he stated. Sheikh Mohammed also stressed the importance of keeping pace with the latest scientific advances in various fields that offer effective solutions to the common challenges faced by societies, especially those related to the climate and environment. This requires continuous monitoring of global best practices to apply appropriate solutions that meet local needs, as well as indigenous efforts to develop new innovative solutions, he added. 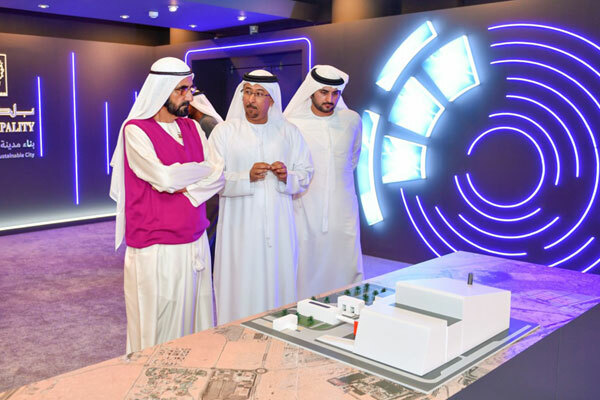 During the visit, Sheikh Mohammed was also briefed about the world’s largest single waste-to-energy plant, being built on two hectares of land in the Warsan area. The plant will consume the city’s solid, industrial and commercial waste and convert them into electricity. Gases produced by the waste will be burned in order to turn a steam turbine to generate electricity. Incombustible material will be left as recyclable ash, from which useful metals can be extracted for reuse. The gas will be treated with lime and filtered to minimise the release of pollutants during processing, said the statement. The plant is set to have a thermal transfer efficiency of 29 per cent, the highest percentage of its kind in the world. The first line of the plant will be operational in 2022, with full lines ready by 2023, spanning an area of 55 acres. The plant will have a processing capacity of 1.9 million tonnes a year, it added. Other projects include the region's first environmental nanometric satellite named DM SAT1, which is designed to collect and analyse environmental data that will be used to find solutions for increasing pollution in cities and to address climate change. DM SAT1 is a joint project between Dubai Municipality and The Mohammed Bin Rashid Space Centre. The assembling of DM SAT1 is expected to be completed in the first quarter of 2019, and launched by year-end. "The real value of projects is measured by its positive impact on society, and its ability to improve people’s lives and achieve optimal use of resources," remarked Sheikh Mohammed.